I decided to use my grandmother's antique dresser for the nursery. However, before it came into my care it already had some pretty bad watermarks from plants on the top (easily 1/8" deep! 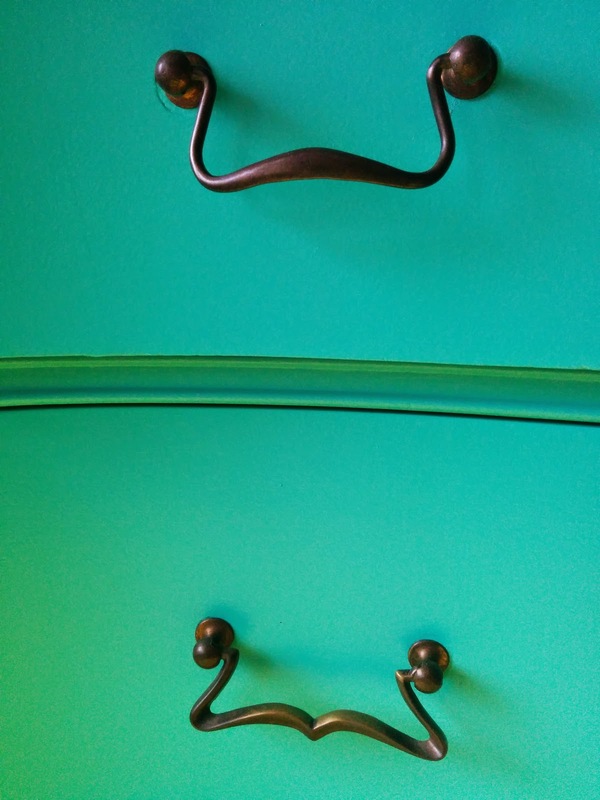 ), handles were broken and missing, and some of the drawers were coming apart. Overall, it needed a lot of love in order to be able to function on a day-to-day basis. Even now I'm not convinced that the bottom two drawers will be up to the task given that they require two hands to be opened --- but it will look great! Depending on the condition of your dresser, some of these steps can be skipped. This is by far the piece of furniture that was in the worst condition of all that I've refinished, so it required all of these steps prior to painting it. Use a screwdriver to remove the handles from each drawer. I also had to remove the keyholes using a very small flat screwdriver to pry out the nails without breaking the keyholes. Remove each drawer and assess whether the bottom is solid. In my case, the two large bottom drawers were not. Flip each drawer over. The way that this particular dresser is made, the bottom slides out and is tacked in place along the back edge of the drawer using nails. 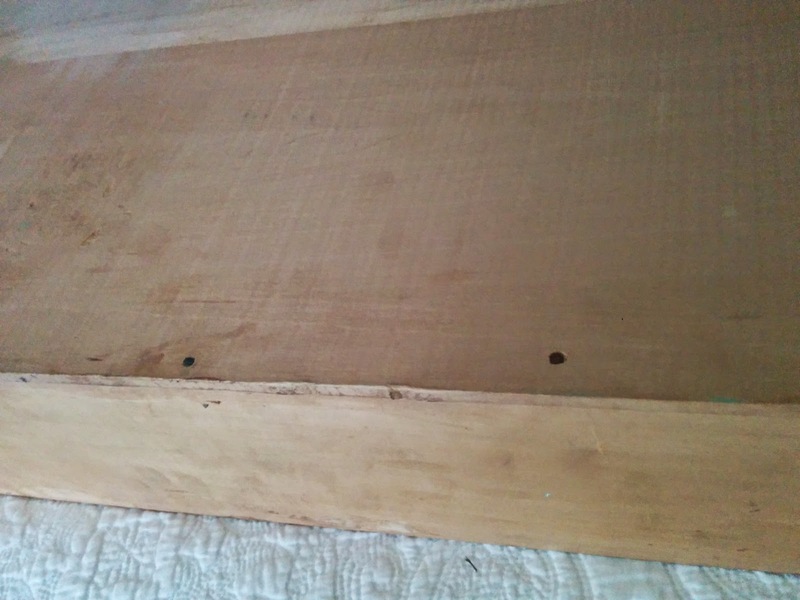 I removed the small nails using the back of a hammer and slid the bottom of the drawer out. I then applied glue to the three other edges. Finally, I slid it back in as tightly as possible and used the hammer to replace the nails along the back edge. Fill in any noticeable gaps with wood filler. 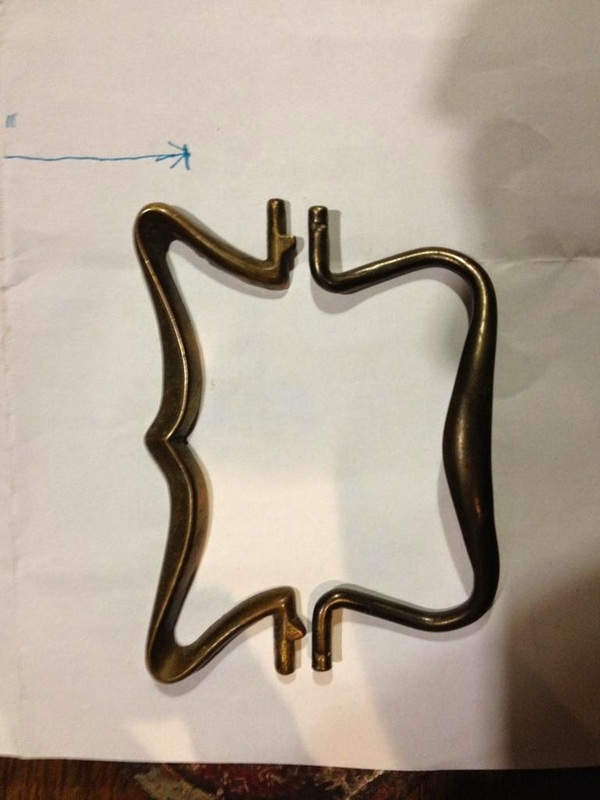 You can just use your finger to get it into the gap and to ensure that it leaves a smooth surface. 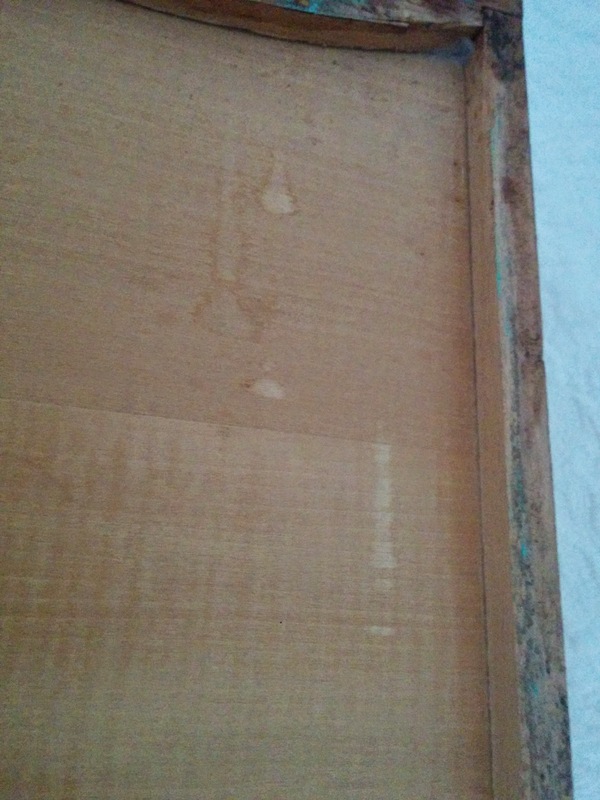 Here's a picture of a finished edge along which I used wood filler. The entire side had a gap, you can still see a small spot along the top edge that I missed if you look closely. Smooth out marks using polyfill. I had two big circle watermarks that were very deep, and the wood filler just didn't work well for these. Instead use a large spatula and polyfill, just as if you're filling in a wall dent prior to painting. Once dry, sand it smooth using fine grit sandpaper. You might want to perform this step twice to get a smoother finish. Once the wood filler and polyfill are dry, sand the rest of the dresser lightly. 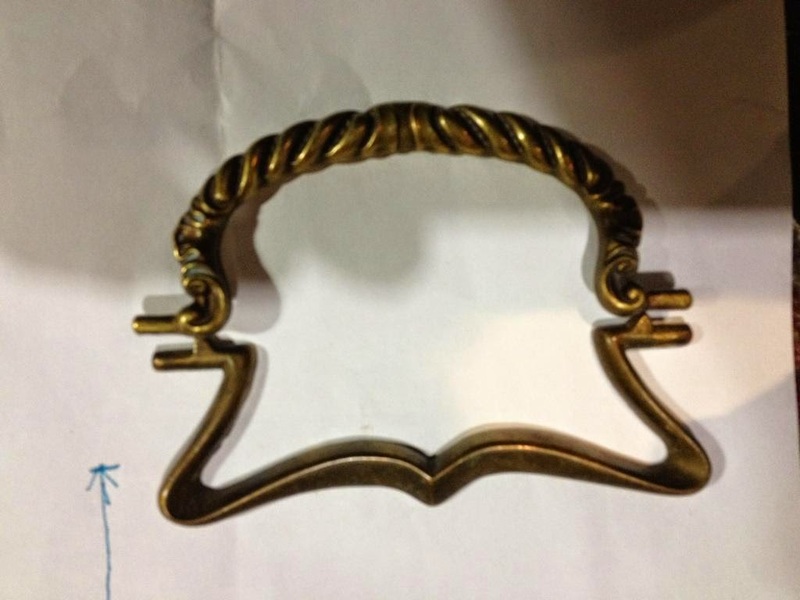 This is especially important if it has a shiny finish as mine did. 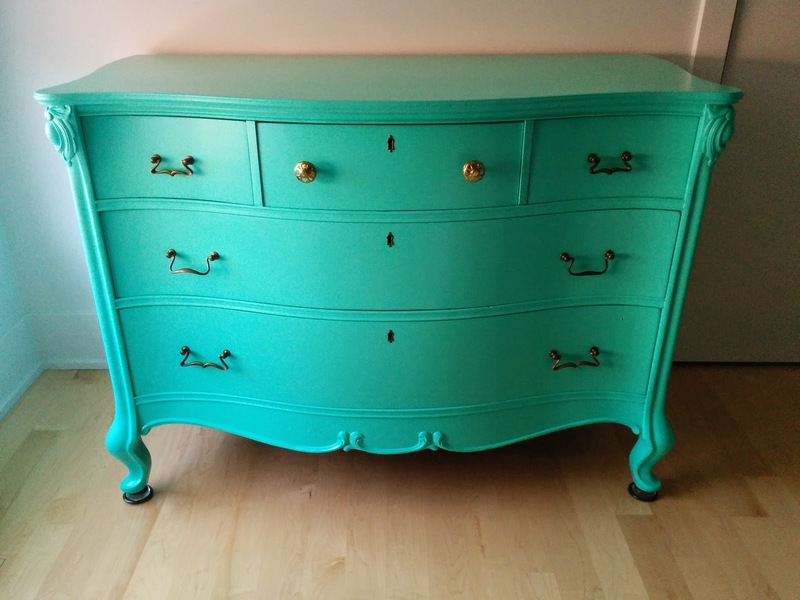 In the past I've skipped the primer, but because this dresser was so shiny I didn't want to risk it. Additionally, given that the dresser is going into the nursery I chose to use a zero VOC primer for this task. Using a brush, apply primer to all of the detailed edges and gaps. Then, use a foam roller for all of the large surfaces including the front of the drawers. Only one coat of primer is necessary. Wait an appropriate amount of time according to the primer's directions prior to painting the first coat of paint. I waited overnight. Pour paint into a small paint tray which will also work for the foam roller. Using a brush, apply paint to the detailed edges and gaps of one side. Ideally before it dries, use the foam roller to apply paint to the large areas connected to this section. Because the paint I selected is meant for cabinets, it's self levelling, so painting the edges and the large surfaces at the same time creates a smoother finish. Repeat until you've painted all areas of the dresser and drawer. 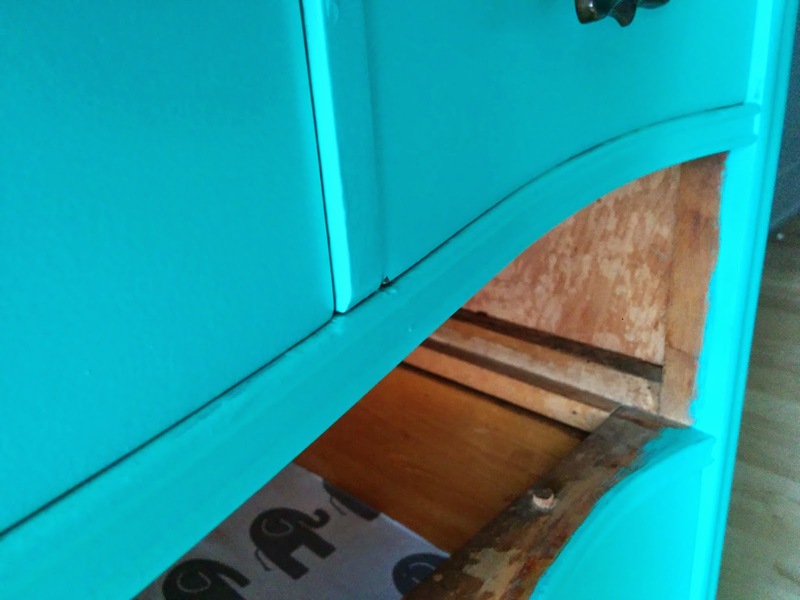 Don't forget to paint some of the area inside the dresser! Depending on the fit of the drawers, some of it will show. You may want to mark these out with a pencil so you know where to stop. If the inside of your dresser is nice and straight, you can also use painter's tape to get a clean line. In my case, given all of the curves I decide to eyeball it instead of striving for perfection. Let dry according to paint instructions. If you're not sure, 24 hours is usually a good guess. Sand very lightly between coats using very fine sandpaper. Wipe with a clean damp cloth and let dry prior to applying the next coat of paint. Paint the second coat of paint similarly to the first. If you notice any spots you missed the first time, paint them first so that you can go over them again as you complete your second coat. One of the knobs was broken, so I had to replace both of them. I went to every antique store relatively close to downtown Ottawa, and the only store I was able to find which had any handles was Yardley's Antiques. 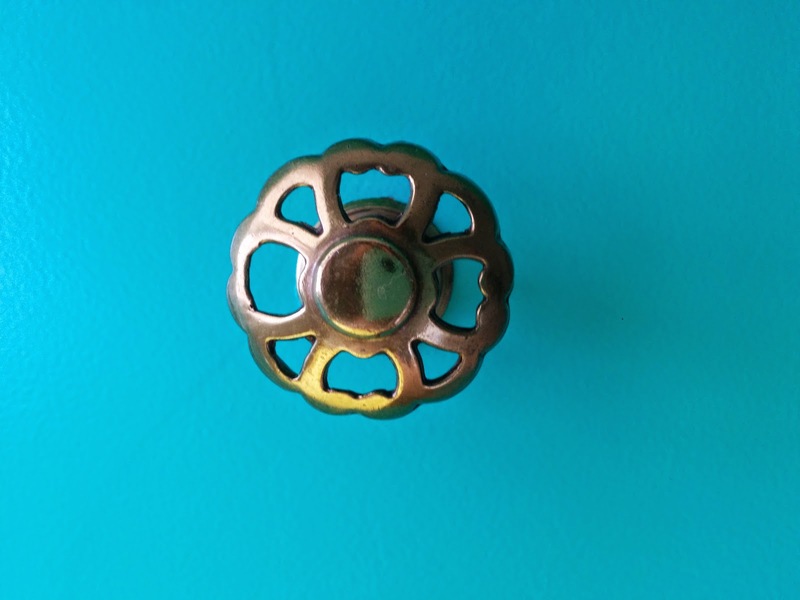 It took scouring through multiple drawers, but I landed upon these knobs, which are a little lighter in colour than the original but I decided I would tolerate anyway. Additionally, I was missing a handle for one of the large drawers, so I chose to replace two of them (but not all!) to get a more consistent look. Luckily I still have the pull holders for either end, so I only needed to find the dangling handle part which proved to make the task easier, though not as straightforward as I'd hoped. I found knobs that I thought would work at Yardley's, but they were too large by a mere 1/8". We tried to drill the hole a tad bit larger to make it fit, but there was no way that it would be possible to pull the handle up, so we decided to look for another alternative. Since the 1/8" of an inch made a difference the first time, they purchased both with the promise that they could return the set that didn't fit. Turns out only Option 2 fit, so there was no decision to be made! Below you can see the new handles on the middle drawer, alongside the old handles on the bottom drawer. If the inside of your drawers needs a lift, you can also make drawer liners as I did. Et voila! 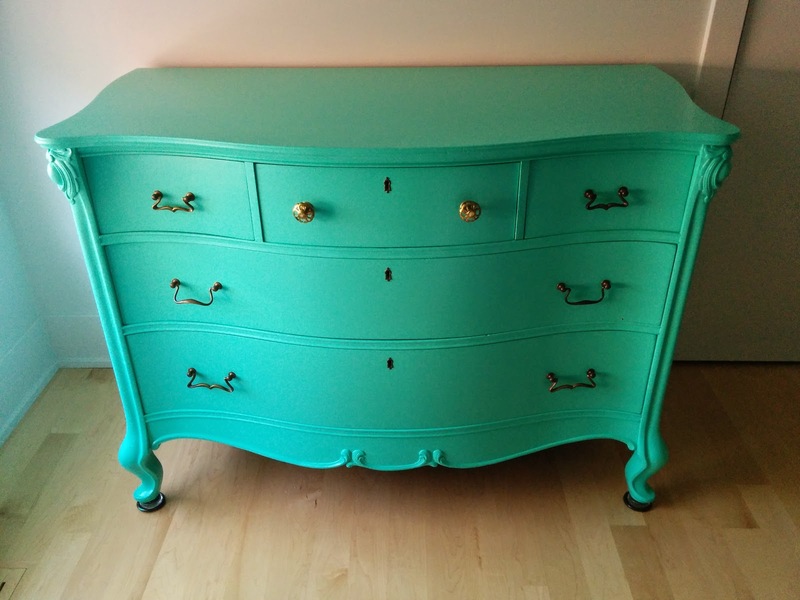 a beautiful dresser and change table to be! 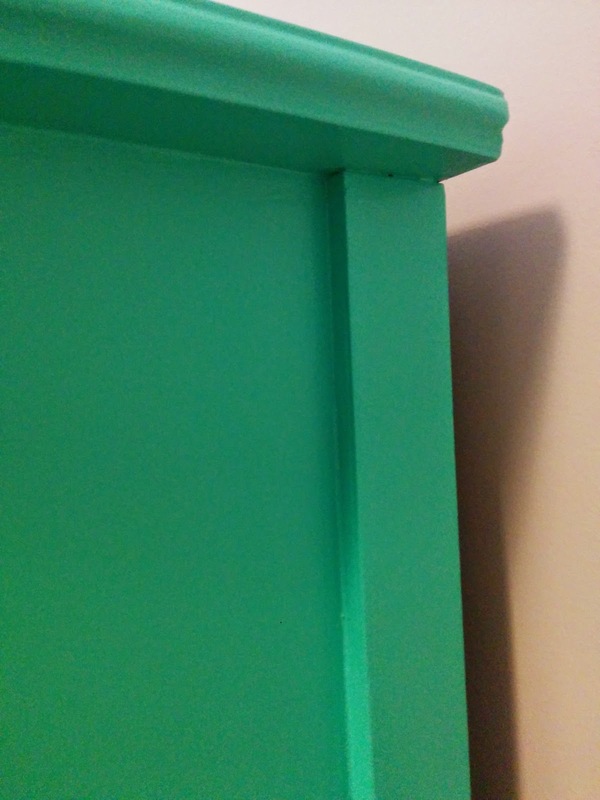 Paint, I used Benjamin Moore ADVANCE® Waterborne Interior Alkyd Paint in Bahama Green because its Low VOC. An alternative I've used in the past which is slightly higher VOC but claims to be very resilient and prevents chipping is CIL Smart3 for Furniture and Cabinets. Primer, I used CIL Premium Primer Sealer for Interiors because its Zero VOC.